I figured it would be helpful to give you a list of items that were helpful for me to snack on that are pretty healthy. It’s hard to stay away from grabbing junk food but your body will thank you later. Keep in mind that these ideas are for snacks only and should not be a meal replacement. Technically it could replace the meal but not on a daily basis. For serious gains, you have to cover your macro nutrients! Plus, you need to just have a well balanced meal for optimum health anyways. 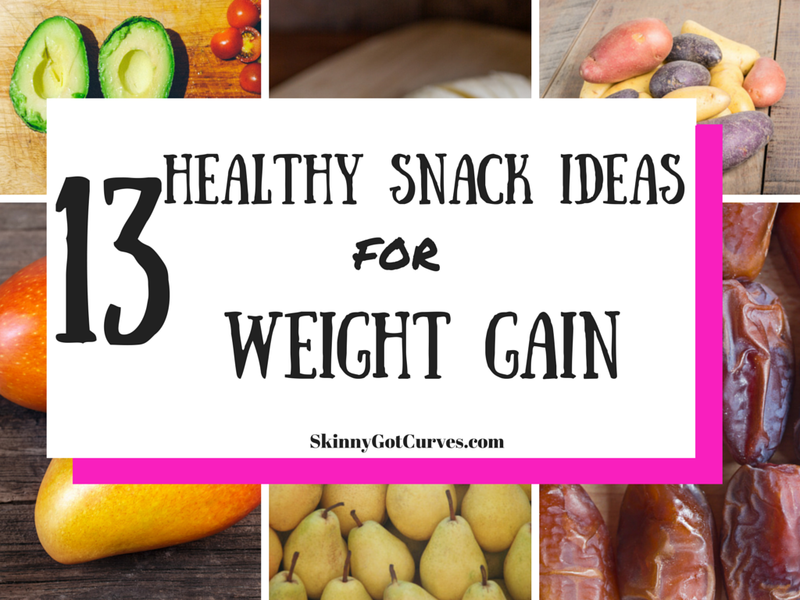 Here is my list of 13 Healthy Snacks for Weight Gain. Oh and yes, I listed all the different kinds of nuts separately. 1. Almonds – I loooovvvveeee me some almonds. Listen, you can’t convince me the Raw Almonds from Trader Joe’s isn’t the ish. No way! I can go through half a bag of these goodies. 2. Brazil Nuts – Hooray for Brazil Nuts! These are high on the list for high calories nuts. However, be careful about Selenium overload. Selenium is good for female reproductive health but too much, like iron, can become toxic to the body. I say add them to a mix of nuts instead of solo. 3. Walnuts – We all know that walnuts are added to most baked goods and we enjoy them. I have to enjoy these with some other nuts mixed in because eating them causes me to be dehydrated. But good news, apparently there are some cancer fighting properties and antioxidants included in walnuts. Then again, many of the items listed here have the same claims. 4. Macadamia Nuts – These are pricey but I do enjoy them every time I make my purchase. I usually go for the unsalted macadamia nuts from Trader Joe’s. 5. 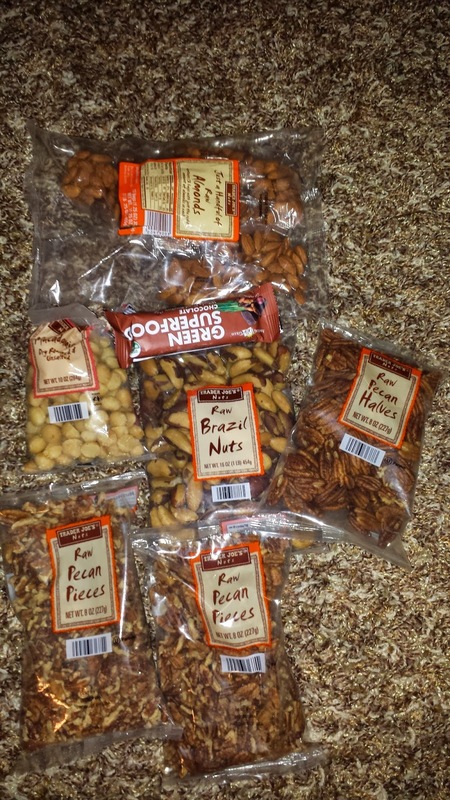 Pecans – I prefer Raw Pecans from Trader Joe’s. Now that’s just me, you can purchase whatever kind your heart desires. 6. Yogurt – Never choose the non-fat yogurts. Just don’t do it. lol! Believe it or not these little cups of goodness can add to your calories. Back in Fall 2014, I was obsessed with the Pumpkin flavored Dannon yogurt. Unfortunately it was seasonal so there’s that. Since this is a light snack, it’s easy to want more than one cup. Plus, it’s good for your digestion. You get to add calories to your diet and probiotics. #winning Great to add to your smoothies. 7. Peanut Butter or Almond Butter – Everybody who’s been trying to gain or has been gaining knows about peanut butters, almond butters, or any other natural nut butters you prefer. This is an easy add on to smoothies, sandwiches, or veggie snacks. You can have toast with peanut butter or make it extra healthy by eating celery and carrots with the butters. 8. Nutritional Shake – I have already blogged about my preferred nutritional drink in this blog post. Orgain Nutritional Drink or Boost, whichever you prefer is fine with me. I choose Orgain because it’s more clean than Boost in the ingredients department. 10. String Cheese & Cheese Sticks – There are a variety of string cheese selections at the market. I always look for the package with the highest calories. It’s usually Sharp Cheddar Cheese or Sharp Cheddar Blend that’s the highest in calories. 11. Protein Bars – I mentioned my Green Superfood energy bars in a previous post seen here. But you can also check out Cliff Bars which I have been loving lately. Here are my favorites. 12. Dried Fruit – These are easy healthy treats for snacks. Be sure you keep an eye on sugar intake though. Although dried fruits are actual fruits, depending on the manufacturer, they will add extra sugar or preservatives. Examples are below. 13. FRUIT! – I created a list not too long ago about Natural Foods for Weight Gain. Check it out and incorporate some of the foods into your daily snacks and/or meals. Quick Tip: Aim for 400 – 500 calories for each serving during your snack time. That way you don’t have to overload on calories for your meals while also achieving your calories goal. If your favorite snacks for weight gain aren’t listed, be sure you name your favorites below in the comment section. « Am I a Straight Hair Natural Now?